Good evening! 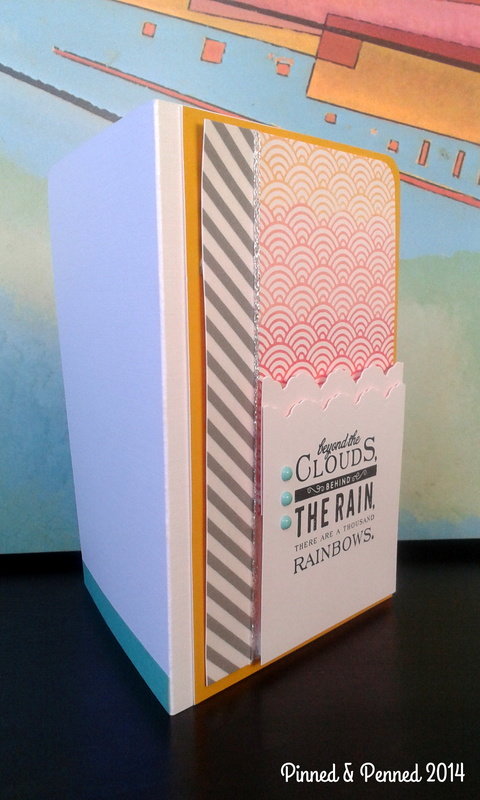 I was planning to pair today’s card with the amazing paper art I have been learning about and viewing recently, but I will have to keep you in suspense a little longer given the exhaustion that is clouding my mind and making it difficult to center my thoughts! And here it’s only Monday! Maybe I should head over to Taheerah’s Cure for the Monday Blues and play along! She always has something fancy and fabulous to see! My entry for CASE Study’s current challenge was designed for someone who is, unfortunately, experiencing a blue time. 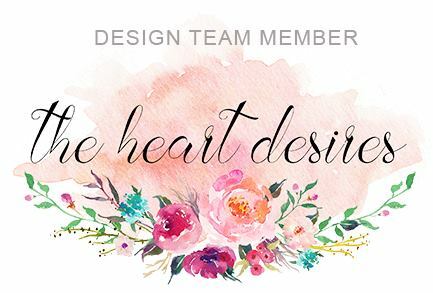 As you can see, I remained faithful to the design by muse, Danielle Flanders. I am always excited when I see other crafters using their tools in novel ways, and am equally excited when I, myself, make such a discovery! 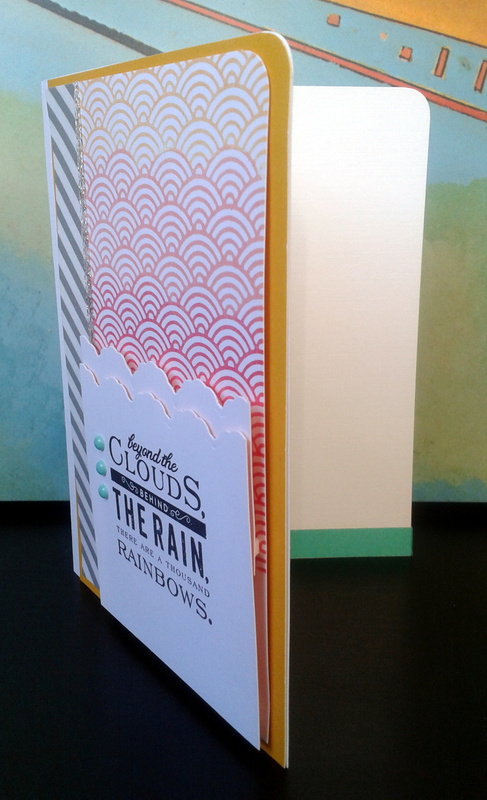 For this card, I didn’t want to complicate the large sentiment by adding embellishments; but I did want to create a cloud-scape. I have a variety of border dies and speech bubbles that could have worked for the clouds; but then I looked more closely at my new Floral Threader Spellbinders dies, which I haven’t put to use yet, and there it was! I just ran the paper through with the long end of the frame die along the edge and, voila, instant cloud border. Since every cloud should have a silver lining, I added some silver thread along the striped washi border. 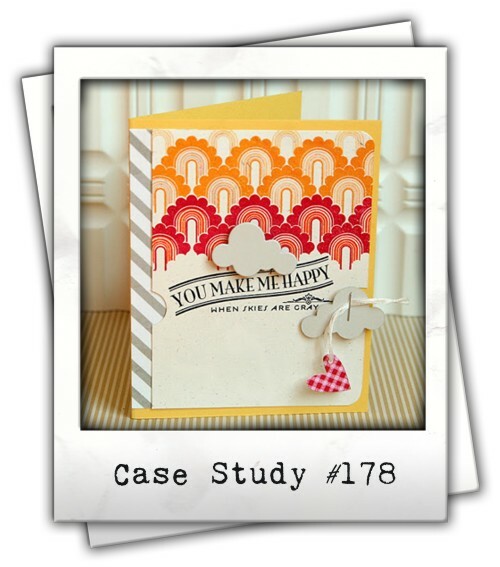 The stamps I used are my new Deep Red Stamps 3×4″ wave background, which I inked with Memento Dew Drop dye inks in yellow and red, and Hero Arts shadow ink cube in Soft Cantalope, and PTI’s sentiment from Movers and Shakers. 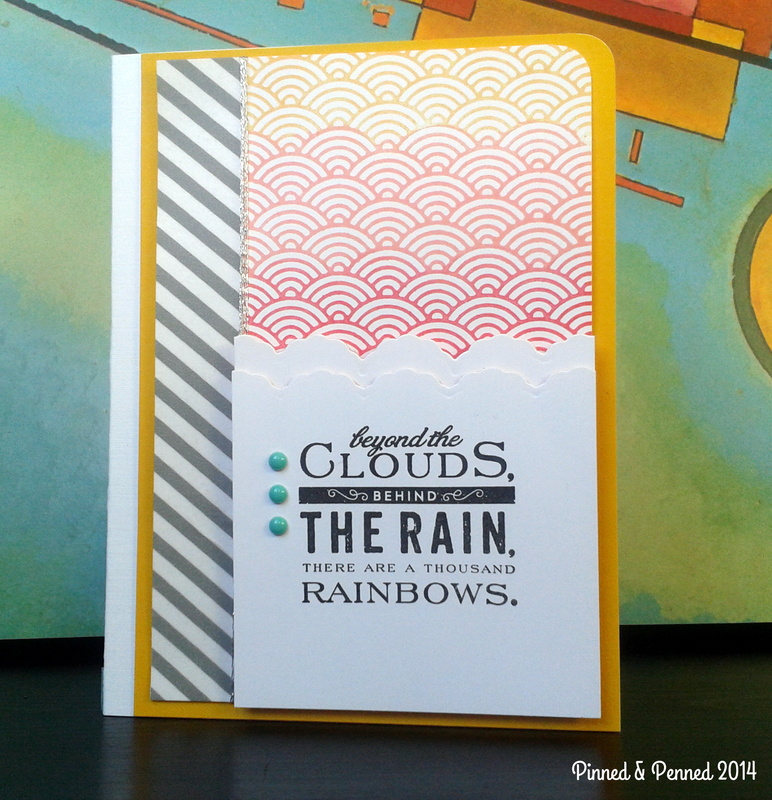 I definitely felt like something was missing from the card, and I wanted to play on the clouds and rain theme. So I added a touch of turquoise in the enamel dots and washi strip. As said in my last post, I am craving turquoise right now! The addition really seemed to do the trick and draw the eye to the sentiment. I am going to leave you with some beautiful art work I happened upon last week; Kate Collins is an Australian painter, and I love what I have seen of her work. I especially love her River River Jewels. These are surely a cure for the Monday blues. May you find silver linings in all your clouds! Cool one, I have been busy with family over to do much challenge play… This is awesome! And YES! I will be at Amy’s 3/8!!! I sure hope that you will be coming! 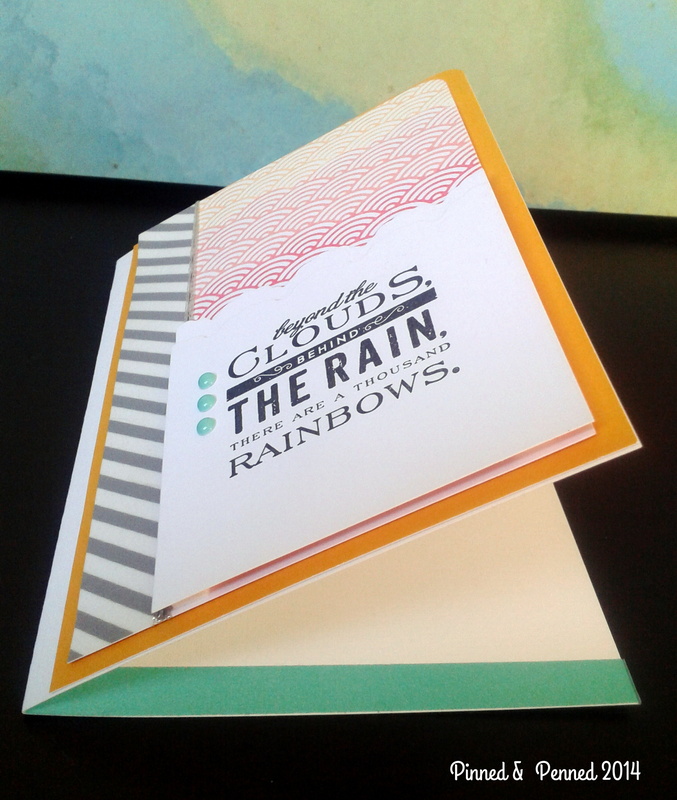 A lovely card and I love the genius way you created the clouds! Oh, this is fabulous! I love it!